It’s a great idea…and nearly impossible to source. 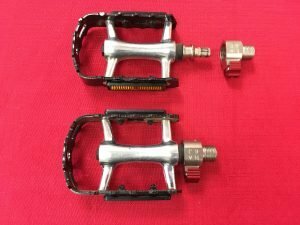 Not only would the pedals need to be a quick-release pop-off design (uncommon), but once we found them in SPD clip style (rarer), the two pop-off designs would have to be interchangeable. The picture quality isn’t great, but we’ll fix that when our shipment arrives. (Yes, we ordered 20 of them for starters). …And then last week, we found it. It turns out that SPD clip-in is only the beginning of the story. Look at the adapter plug. 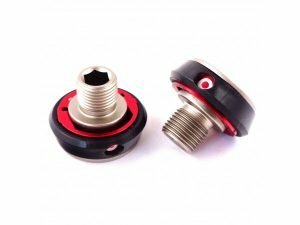 It accepts a hexagonal shaped pedal shaft, like those that come on our standard shipped pop-off pedals and Magnesium mountain bike pop-off pedals, but also has a round ring like our MKS pop-off pedals (but more advanced). This could be the best of both worlds, providing the swappability that serious riders demand, but with an even higher-performance adapter. We’re going to update all our bike pages soon with this info, but everyone needs to know now–all bikes from Flatbike already ship with pop-off pedals. Hopefully we’re shipping the correct pedals for your needs. If not, just let us know your preferred change, and we’ll swap them out before your bike leaves the shop. The idea of a pop-off pedal is simple. A quick release on each crank allows you to remove your pedals in seconds, so it’s easy to do whenever it is convenient for any place you store a CHANGE bike in a confined space (car trunk, private plane cargo bay, boat hold, truck cab, RV storage drawer). You might even find yourself removing a pedal or two to save shins when you’re walking a bike through crowds or in a non-riding area. All pedals can be removed in seconds. These ship automatically with every CHANGE bike. The glamour shots of our bikes don’t show pedals, but seriously…what good is a bike with no pedals? You automatically get a standard set of pop-off pedals. 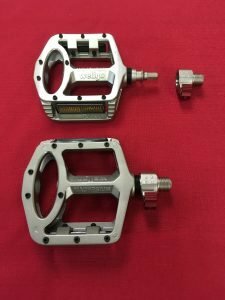 Pro: These pedals are uniform on both sides, reasonably good grip, and have a pull-out latch that never opens accidentally. These will grip your feet on demanding riding courses. Wellgo did some interesting marketing with these. They’re made of aluminum, colored “titanium”, and branded “Magnesium,” of course. But it’s a good design. Pro: These extend an extra 1/2″ to the outside and sides, with more shoe contact points, making them less likely to scrape a shoe sole on the inside. Con: These are a few ounces heavier than the standard pedals. Today, these are the pedals for anyone who doesn’t like side-latches. Side-latches aren’t for everyone. If that includes you, just request a swap-out for these at ordering. Pro: The round latch for these MKZ pedals is unobtrusive and shoe-friendly. Con: The pedal is asymmetrical, with a lip that you roll under your foot to get it into position. And the lock has a plastic safety ring that you probably won’t need, but might, depending on our riding style. Whatever CHANGE bike you order, it comes standard with pop-off pedals and pull-out quick-release. If you want a different set, either mountain or hidden-release, just ask at ordering, and we’ll swap out for free. In most cases, people will not want a second pair until we get the pop-off SPD pedals in stock–our shipment is ordered, but on international cargo timelines. 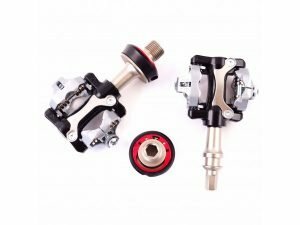 In that case, you can still order a bike now with one of the two hex-shaft pedals (regular or mountain) and it will be compatible with SPD pedals once they arrive. SPD pedals can be back-ordered at time of bike purchase (once we get a better picture) or purchased once they arrive, which we currently anticipate in early March. 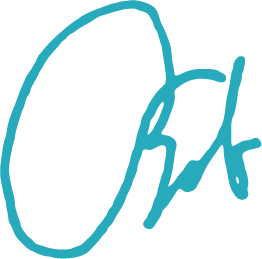 In the meantime, help us plan inventory. Is this development important to you? I am in NSW Australia. Can you tell me the cost to get the mountain bike clip off pedals shown here to me please. Or is there an Australian distributer. Hi, Scott. With CHANGE bike/frame needs in Australia/New Zealand, we usually send folks directly to Changebike. But this is a new request for us–something that Changebike doesn’t carry. And…we’re also running low on the MTN pedals and need to restock. So we don’t have a quick answer for you. We’ll source this again, and check out shipping costs to Australia. Then we’ll have both a cost estimate and a delivery estimate (which will be at least several weeks, since it will include our inbound shipping time). Hope that helps. Great question, Matthew. Pop-off pedals consist of a standard pedal (SPD, flat, MTB) attached by sealed bearing to a custom shaft. Pop-off SPD pedals sound like a great addition to your van, but “converting” them to go from one sealed bearing and shaft to another is a nonstarter. Even if you had deep machine-shop background, your starting point would be … a purchase of a set of pop-off pedals to get the shaft, probably the SPD ones so you could get the second-generation latch too. And then why convert, when it’s in your hand already? 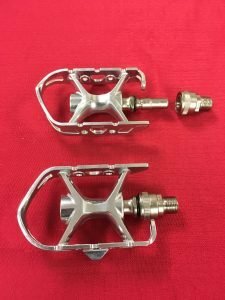 These are in stock now, and the link is https://flatbike.com/product/spd-pop-off-pedals/ .